U.S. director James Cameron's blockbuster (AVATAR) has brought the audience to a whole new level of realistic world 3D, allowing audiences to experience the thrills of 3D experiences, which has officially introduce a whole new era in 3D big screen. Even the world's most famous sports television network ESPN also follow the 3D wave, has announced that South Africa World Cup this year is going to apply 3D stereo broadcast technology. ESPN plan to air atleast 85 sporting events will be broadcast live in 3D, which include June 11 of this year's World Cup opening match and the other 24 World Cup games. CEA has made an investigation base on the current 3D waves, report shows that 25% adults have seen atleast a 3D movie in every year. The major electronics companies have invested more money in the 3D industry, to bring about an upsurge of consumer chase in 3D waves, introduce 3D visualization's products into average home. Market research is xpected to hit a target of 1.2 millon units of 3D TV shipments this year, and increases until 15.6 millions on 2013. on year 2018 3D TV market will reach 17 billions U.S. dollars. American Fu-turesource consulting firm expects 3D TV in the U.S. family will rise from 3% to 45% on 2014. Consumer Electronics Association (CES) investigation shows, around 53% people hope to experience 3D TV program at home. According to the current 3D technology, the level of innovation activities,and perhaps we will soon be able to enjoy 3D TV broadcast and reading children's 3D photo album on our flat panel TV, even without wearing 3D glasses. On April 22th, the same day as International Earth Day, simultaneouly has issue of the world's first Blu-Ray and DVD of "Avatar" movie, during the first two days had already exceeded 1.5 million copies of Blu-ray disc sales records, which previously entrepreneurs have estimated Blu-ray discs sales are expected to surpass 4millions copies. Report shows, as the best 3D vector for family - Blu-Ray disc has improved its 3D paces recently, with sony, samsung have introduced 3D Blu-Ray players, the new 3D specifications Blu-Ray Disc market is inevitable. Moreover, introducing 3D visuals into family is not only limited to television. Acer, Asus already disclose a computer with 3D display products, hence introducing more interesting 3D visual entertainment. Some analyst says all video devices have the potential to convert into 3D imagery. 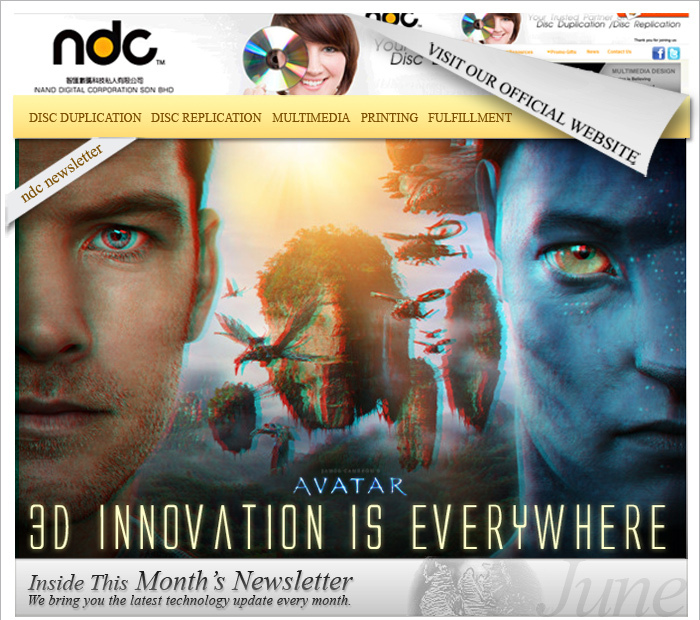 Nand Digital Corporation Sdn Bhd is the nation�s premier choice for creative development and new media. We consult with each client to discover and highlight and deliver a distinct competitive edge. �Trust� is the foundation of Nand Digital Corp�s approach in businesses and it is subsequently the key for its success. Nand Digital Corp. has created a sustainable partnership with its suppliers and clients. Through the company's rigorous quality control and monitored testing environment, Nand Digital Corp can guarantee to supply the highest quality products. 43-2-2 Block G, Jalan 3/101C, Cheras Business Centre KM 8 Jalan Cheras, 56100 Kuala Lumpur. Copyright � 2010 Nand Digital Corporation. All rights reserved.